SAN JOSE — A panel discussion on “Filipino Americans and the History of San Jose Japantown” will be held on Saturday, Oct. 19, at 1 p.m. at the Japanese American Museum of San Jose, 535 N. Fifth St., San Jose. Organized in conjunction with the Santa Clara Valley Chapter of the Filipino American National Historical Society, this panel will explore the shared history of the Japanese American and Filipino American communities in San Jose’s Japantown and how the two communities might work together in the future in preserving the cultural heritage and history of the area. • Tom Izu, executive director of the California History Center and Foundation at De Anza College in Cupertino. He has a long history of active service in the San Jose-area Japanese American community. A past board member of the Japanese American Museum of San Jose, he now serves on its advisory board. • Ron Muriera, administrator of the Filipino American National Historical Society (FANHS), FANHS national trustee, Santa Clara Valley Chapter, and trustee, Northern California Filipino American National Historical Society. • Robert V. Ragsac Sr., whose parents who migrated to California in 1927. Born and raised in the Chinatown/Japantown area from the 1930s to 1950s, he is a retired space systems engineer and is currently active in capturing the story and history of the first wave Filipino immigrants of the 1920s and ’30s who settled in San Jose. 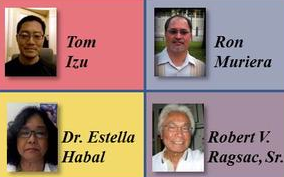 • Dr. Estella Habal, associate professor of Asian American studies at San Jose State University. She has written a number of books and essays on Filipino American history, from their role in the International Hotel struggle in San Francisco to their participation in the 2008 presidential election. Cost: Free with admission to the museum (non-members, $5; students and seniors over age 65, $3; JAMsj members and children under 12, free). RSVP required. Reserve your spot by emailing [email protected] or calling (408) 294-3138.